Readings: The reading assignments are listed below. Complete the readings before the corresponding lectures if possible. Lecture Notes will be placed on the web before the corresponding lecture, although in some cases it may be only hours before the lecture. Homework: There will be several homework assignments, generally due one week from the time it is assigned, unless otherwise specified. Presentations: There will be no exams in the course, but the final grade will be based largely on an oral and written presentation given at the end of the semester. You should get approval of the topic before committing to a particular topic. Some of you may elect to work on a hardware project, which we will discuss during the first few weeks. Grades: The grades will be based on attendance (5%), homework assignments (35%) the oral presentation (20%), and written report (40%). Other Resources: There are many other resources we will make use of during the semester, including the latest lectures from the Synthesis Imaging Summer School, the Essential Radio Astronomy course, and excerpts from various other sources. 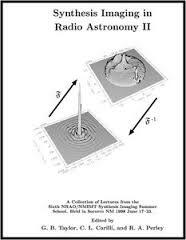 We will use tools like CASA (Common Astronomy Software Applications) and Miriad for creating, calibrating, and analyzing radio data, and Python for general purpose programming and as a scripting interface to these tools. Note that Python has many extension packages, which you can install yourself, or alternatively you can download the Anaconda Python pre-packaged distribution for scientific computing.